Tom Booty, Lead Officer, Strategic Asset Management, Denbighshire County Council and Craig Sparrow, Executive Director of Development for the Pennaf Housing Group are pictured (centre) receiving the Best regeneration Project Award from compere Tom Ward, left and Andy von Bradsky, right, Chairman of Housing Forum and Design, at the UK Inside Housing Development Awards in London last week. An innovative housing scheme at the heart of Rhyl’s regeneration initiative has won a prestigious UK award. 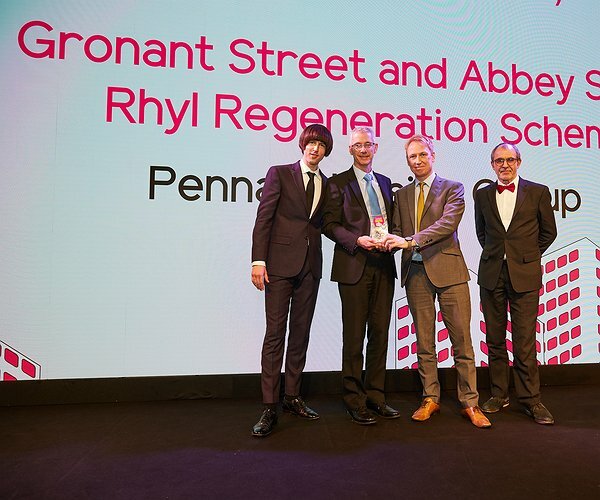 The Gronant Street and Abbey Street scheme developed by the Pennaf Housing Group, next to the new Gerddi Heulwen greenspace in Rhyl, was the overall winner of the ‘Best Regeneration Project (under 70 homes) at the 2018 UK Inside Housing Awards ceremony, held in London last week. The scheme is a key signature housing element of the transformational urban regeneration partnership project in partnership with Denbighshire County Council and the Welsh Government. The homes are a mixture of affordable homes for local people to rent or for home ownership under the Welsh Government Homebuy loan scheme. It is managed by Clwyd Alyn Housing Association, part of the Pennaf Housing Group. “We are absolutely thrilled that this ambitious, innovative scheme has won national recognition. It is a real tribute to more than a decade of visionary partnership working with both the Welsh Government and Denbighshire County Council who had the foresight to recognise the integral part that high quality affordable housing for local people plays in the transformation of the town,” said Craig Sparrow, Executive Director for Development for Pennaf. The £3.6 million development is one of a number of different housing options created around the Gerddi Heulwen greenspace and, as well as winning the overall ‘Regeneration Project Award it was also a shortlisted finalist in the ‘Best Residential Development’ (Under 70 homes) and ‘Best Affordable Housing Development’ (Under 25 homes) categories. "Tesco treat for local residents"